I love an easy technique. I often look at some of the complicated projects that fellow Demonstrators and customers come up with but I'll be totally honest with you- I'm lazy and like to do things that don't stress me. So I love a simple but effective technique. Have you tried the Shaving Foam Technique? You mix Shaving Foam with ink and apply it to your card base and basically the mixture of the two ends up dying the cardstock. It's really easy but does need a bit of practice first. I've discovered that too much ink is not helpful (it drips everywhere if you're not quite with it!) and too much shaving foam is not helpful, either. You just need a little bit! Watch the Shaving Foam Technique in action - what a mess! Some weeks ago I tried filming the Shaving Foam Technique and made a complete mess! Neither my hands or brain were working particularly well that day and I had trouble co-ordinating myself. Unfortunately the result of this is that I look useless, rather than just struggling, but I have to laugh at myself. What a mess! Watch Take 2 - and learn the knack! I decided to give this another shot to show the true potential of the Shaving Foam Technique. The second time around I was careful not too use too much ink (no dripping!) and equally not to use too much foam. I've done this technique before so it should have been plain sailing but as I said above my brain just wasn't working on this day! So as I described in the video you need three main ingredients: Ink Refills, Clear Blocks and Shaving Foam. I used Night of Navy, Pacific Point and a tiny bit of Bermuda Bay for this particular project. 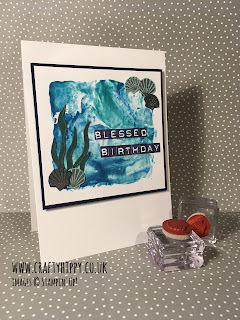 I used the Seaside Shore stamp set to stamp and emboss the shells and seaweed, and I used the Labeler Alphabet stamp set (one of my favourite stamp sets) to create the sentiment. 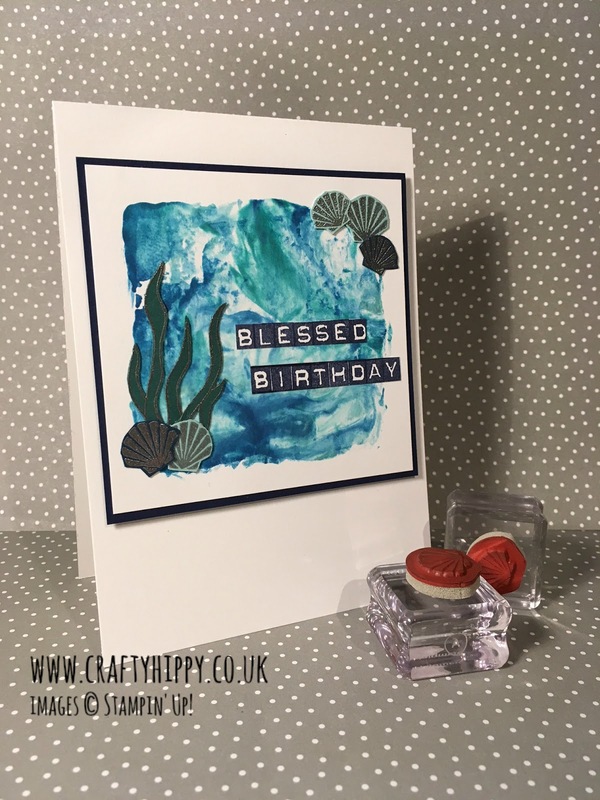 Of course you could use any combination of colours, depending on the theme of your card. It's amazing what a change of colour will do to the look of a project, and the nicest thing about this technique is that it's different every time, meaning that no two cards are the same. 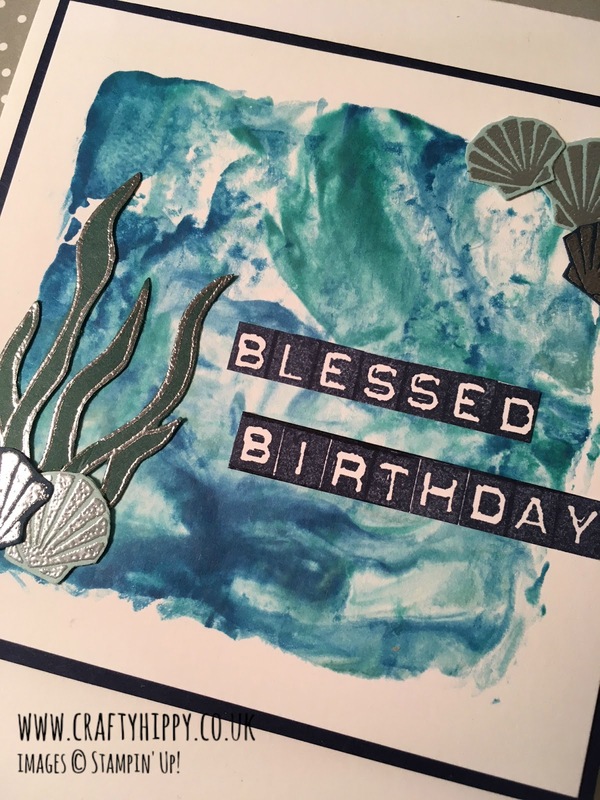 Which is the whole point of handmade cards, and the beauty of them. I hope you give this technique a go as it's so much fun. Make sure you send in pictures of your creations!